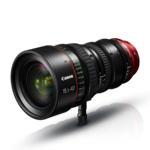 The Canon CINE-SERVO 50-1000mm T5.0-8.9 ultra-telephoto zoom lens provides 4K performance for Super35mm large-format single-sensor cameras and accommodates either broadcast or cinema-style production due to its removable Digital Drive unit. 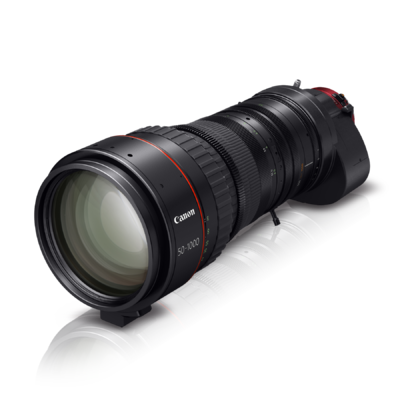 Available in EF- or PL- mount versions, the lens delivering the world's longest focal length (75-1500mm with its built-in 1.5x extender) and highest (20x) magnification among super 35mm zoom lenses as of October 16, 2014. The lens is great for sports, nature documentaries, and other types of long-zoom field production, yet it's easy to carry, has a relatively compact form factor of only 16.3 inches in length, and a weight of just 14.6 lbs. It can be used with major brands of single-sensor Super35mm cameras and conforms to industry-standard camera-to-lens communication protocols including 12-pin serial communication (common to major broadcast camera brands) and Canon EOS technology. 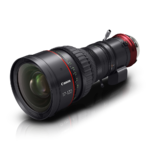 The CINE-SERVO 50-1000mm T5.0-8.9 ultra-telephoto zoom lens allows for close-up 4K imaging of wildlife subjects while still maintaining the physical distances necessary in such shooting situations. Ruggedly built, its removable Digital Drive unit allows for broadcast-style operation with a convenient zoom/rocker switch, programmable zoom and focus settings, and data connections for use with broadcast-type field/studio zoom and focus servo-demand controls. 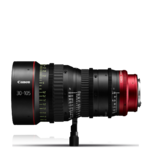 Removal of the Drive unit enables Cinema-style operation; the lens includes clearly engraved barrel markings, an 11-blade iris to help achieve smooth "bokeh" backgrounds, and compatibility with lens-support rods, matte boxes, and other cinema accessories. 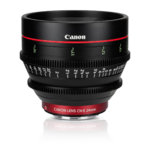 Converting the lens to a PL-mount version can be handled by authourized Canon service facility.